Congratulation you just officially visited India ! Oh, the sentence which usually will be given to tourists who just posed and took a photo in front of the iconic Taj Mahal. Even, i spent much times to get the best photo of mine with the Taj background without any people or any tourist bothering on the frame. 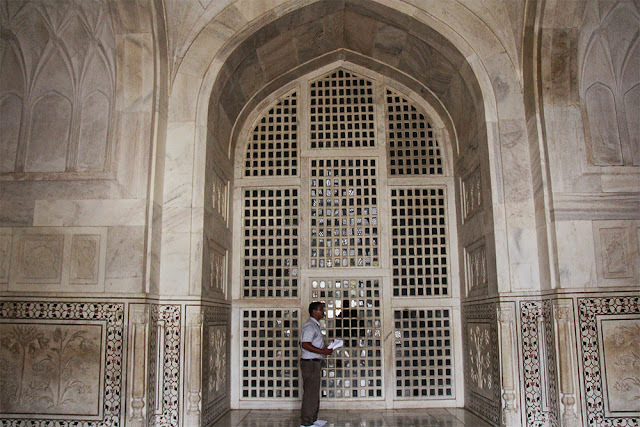 No, i am not gonna tell you why is it named Taj Mahal or the times when it discoverd or other general knowledges, because you can google about it anywhere else. 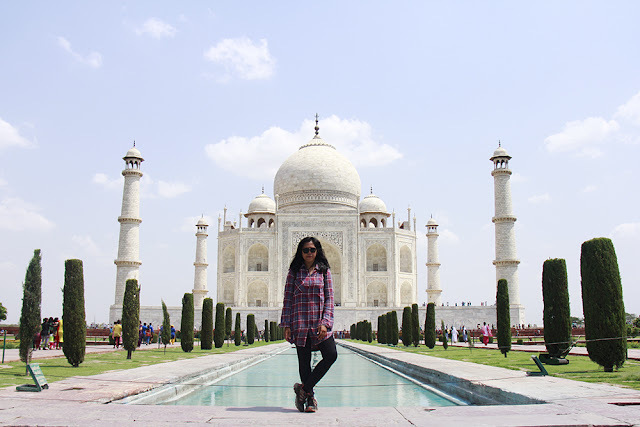 In this post, i am gonna write a story of my journey from 2 different side, the two of them are "What i expected about Taj Mahal" and "How the real Taj Mahal i experienced". 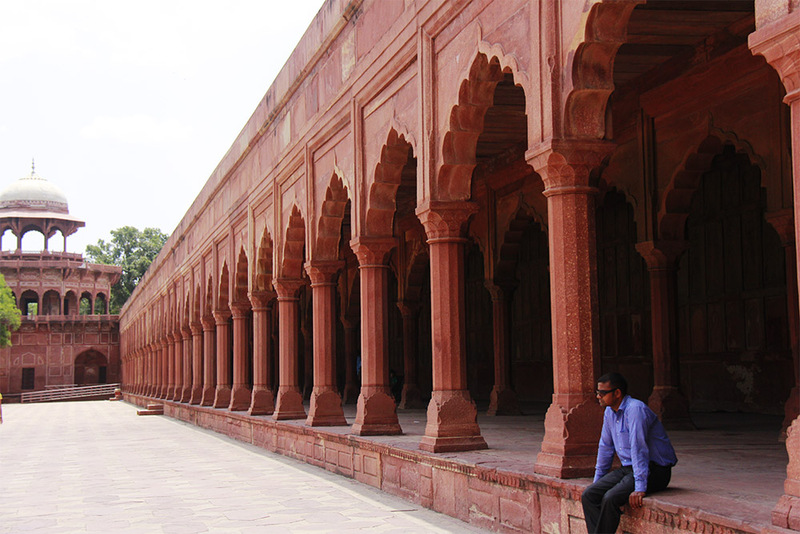 I read and did the research before arrived in Agra, the nearest station of Taj Mahal are Agra Fort and Agra Cant. 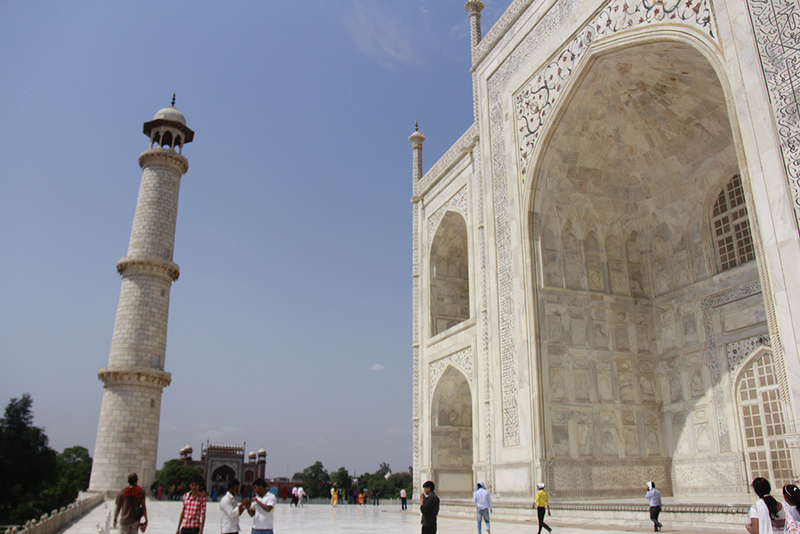 From the station you can take the taxi or rickshaw to reach the taj mahal Area. There are many home stays near the Taj mahal where you only need 10-15 minutes walk to get the Taj. I arrived in Agra Cant at 19.00 pm, and took a rickshaw for 150rps. There are so many rickshaws parked, but you'd better go to the prepaid counter to get the fix price. The distance itself is only 15 minutes away. 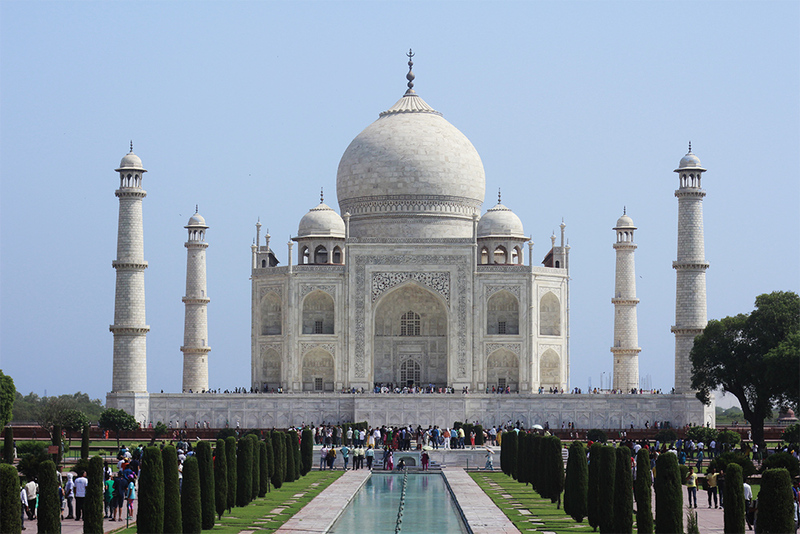 Yes it's true there are many homestays near the Taj mahal. 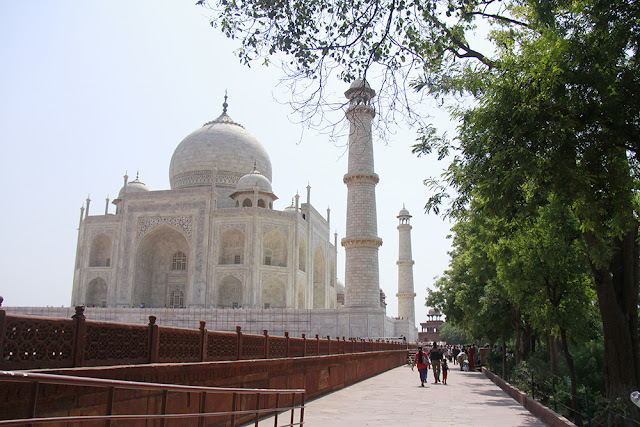 the reviewer of my homestays said, the hotel i chose is located only 10 minutes walk to Taj Mahal and by going to the rooftop, the Taj Mahal rooftop was seen. 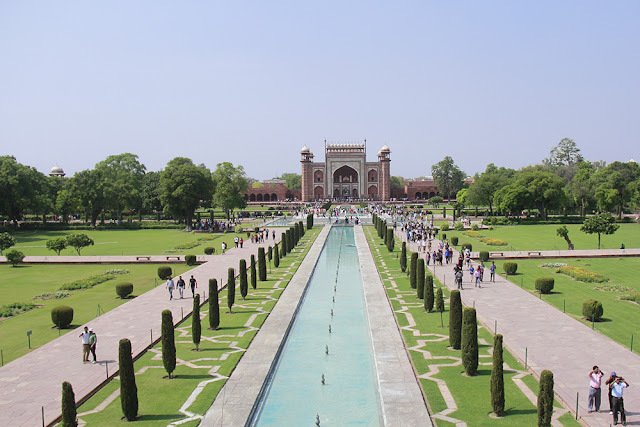 The hotel where i stayed is "Friends Paying Guest House"
One of the cheap home stays with good review around Taj Mahal, the location is also strategic, the staff who taking care of the guests is the son of the owner, named "Bilal". He's still young and have a big interest of cultural exchange. The room itself is quite good for price only $10/night with non-ac (fan only). I choose non-ac because i thought it's only 1 night stay, and we already arrived late on the night though. After the long journey of 25 hours on the train (read the story here), i directly went to the bathroom once i finished the check in process. It was really hot, and for the first time of my life i blamed myself to choose the non-ac room. Oh God, it was extremely very hot even when i have finished showering, i was still sweaty. As i know, India is a country which popular by its Hindu majority inhabitant. When i arrived in Agra and did the check in process on my guest house, the officer said that the person in charge of this guest house (which is his brother) is now at the mosque and will be back come to me soon. Few minutes later, he came back with a muslim outfit. You also will hear adzan from the nearest mosque 5 times in a day as how muslims pray in a day. I got a little bit disappointed as what i saw and experienced is not as i expected. I was welcomed by a very huge gate, the Taj Mahal is 400 meters away from the main gate. I can saw it's really beautiful even only from the gate. The popular pond in front of the building looked as beautiful as on people's photos. I walked through the very clean garden. The surrounding of Taj Mahal is very well maintained, no rubbish found, even the grass and plants looks so fresh. View from Taj Mahal, a very nice garden. As i paid for the ticket, i were given 1 cold bottle mineral water (it was very hot in Agra, trust me) and two pair of footwear cover to cover my shoes, so i did not need to take off my shoes. 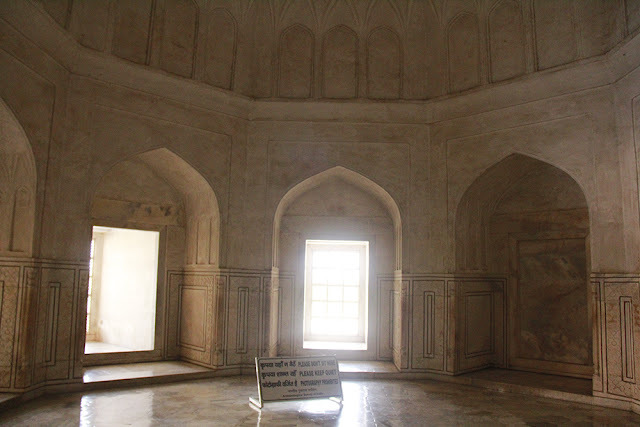 It was a little bit crowded inside the Taj Mahal, i went inside through the main gate, there was an inner chamber where Shah Jahan and Mumtaz Mahal grave were located. There were so many people took pictures and tried to put their hands inside the chamber. It was dark, not bright as i expected before, the marble was also cream instead of white. And it didn't look like that spacious one, and oh yeah everyone was busy taking selfie inside the building, eventhough there is a sign of no camera allowed and there were some officers oversee the visitors, it is still so easy to see people taking picture including myself. 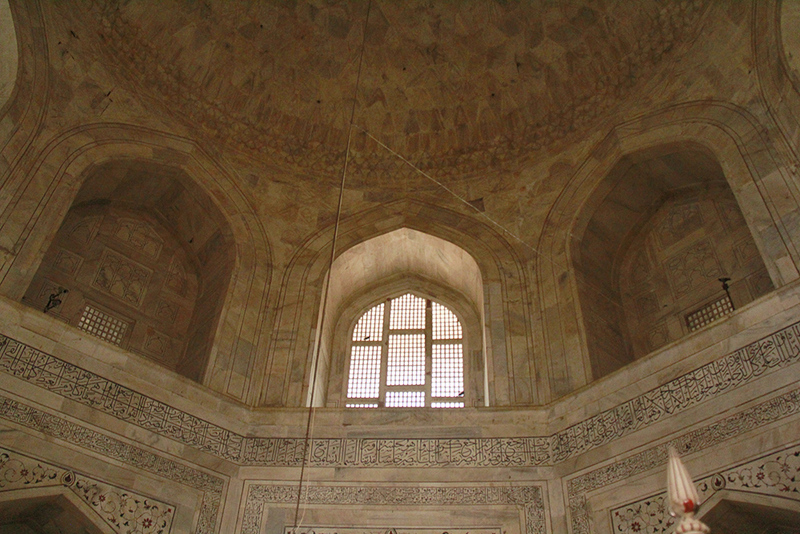 Interior of Taj Mahal uses marble. 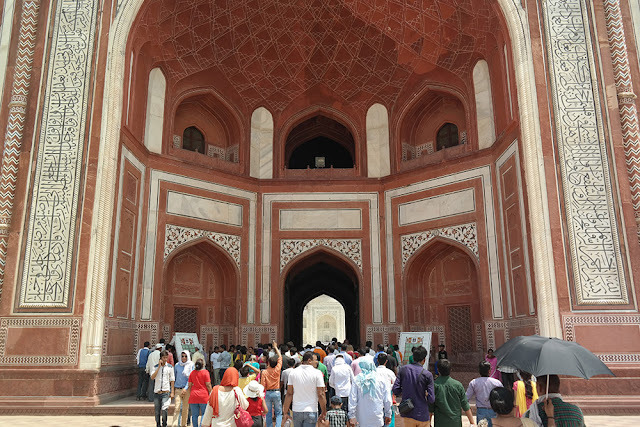 I once read while doing a blogwalking, that i'd better to hire a half-day trip rickshaw since it's quite far to reach the Taj Mahal from the entrance gate by walking. 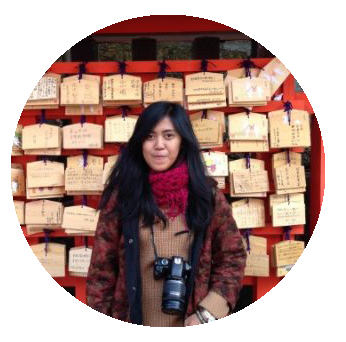 When i just arrived at the guest house on the night, i still remember, the rickshaw driver who ride me from the station waited me on the lobby. I got confused since i already paid the fee, and then i asked him "is there anything else?" then he answered "how about tomorrow ? have you hire a rickshaw for taj mahal tour?" he described how the tour would be with some photos he has. He offered me for a half-day tour with 2000 rps. 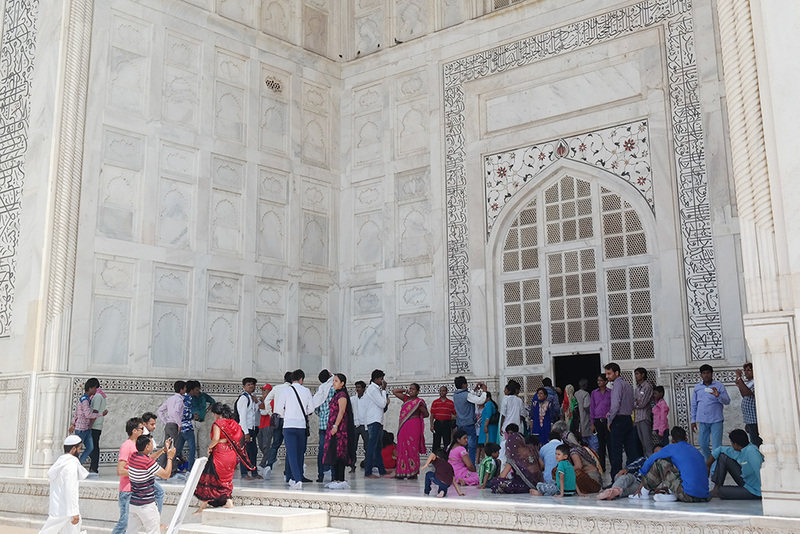 I followed what my guest house officer said, that it's only 10 minutes walk to Taj Mahal from the guest house, and i did not need to hire the rickshaw. Well since, i was really on the tight budget, i prefer to explore by myself. 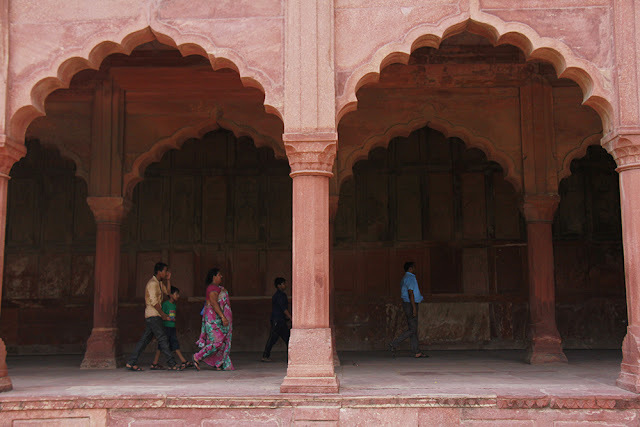 A full day in Agra only for enjoying Taj Mahal by walking.